I’m not someone that licks my lips really, but I did have a go just to taste it! The taste is neutral to pleasant. Even if you don’t like honey, I think you’d be OK, as it doesn’t have a strong flavour or smell. It has the texture you would expect from a lip balm, but it isn’t greasy or oily. It feels nice. It’s a big bonus for me that it has a natural smell as I really can’t stand the artificial smells of many lip glosses etc. This lip balm was right up my street; chemical free and with no artificial smell that so many have. I like that it’s an edible product as there is so much rubbish in some lip balms. I had to do some reading to learn what it’s all about but the fact that it repairs damaged skin and prevents infection is all good. They don’t seem to use palm oil which is a great big plus for me. It stayed on my lips for a while. Some balms seem to need reapplying every 10 mins or so, but I could feel the honey lip balm on my lips hours after applying it. I am not much of a lippy girl, much to the disgust of a few make up consultants that I know, but I was happy to use this and actually reached for it when I was on my way out to deliver a seminar. It feels and looks nice on my lips, not greasy or over shiny, in fact leaves almost a matt effect. I do think Australian products are good as they take the whole sun damage thing much more seriously than we do. The tingle thing is interesting but I don’t really know if it has a role other than that. The design is OK, I like the colours used, but there is too much crammed onto the label. Also the screw bottom looks too much like a glue stick. There was a minor problem that, being us, we fully wound it up but then it doesn’t wind all the way back down again, unless you give it a push. It is £3 which is a good price for a quality product. Two of us have been using it for a week and have hardly made a dent in it. Sun or wind damaged lips, but I would say that it’s good for everyday use too. I would definitely buy this product and so would my my teenage daughter. She liked it so much, I often couldn’t find it! With thanks to MooGoo for sending a sample of MooGoo Tingling Honey Lip Balm to our reviewer. 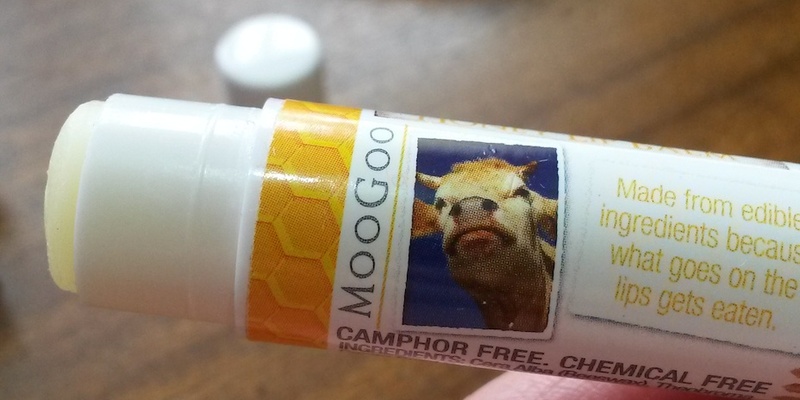 Buy MooGoo Tingling Honey Lip Balm.